Does your data cabinet resemble spaghetti Junction? Smart IT offer a complete re-patching service, which can be conducted outside of normal working hours, this can help maximise the performance of your network and keep a safe, tidy working environment. Trailing cables in the workplace are serious risk to health & safety. 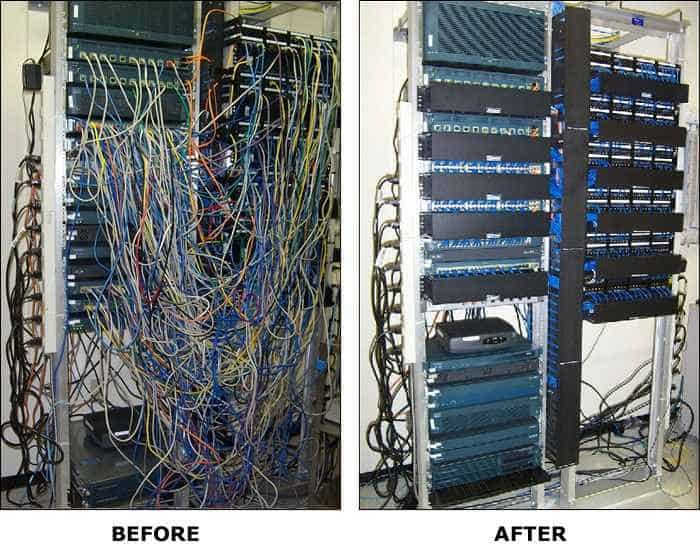 ‘Spaghetti cabling’ in your comms room or data centre can reduce performance and cost you time and money when any changes are required. We offer a cabinet changeover service to help you fit more devices into the network cabinet and allow for future growth. Or simply re-patching your cabinet with brand-new colour coded patch cables in the correct lengths to ensure they look tidy and are easy to identify. Contact us today on 0330 223 3525 to arrange a viewing of your existing cabinet and no-obligation quote.